According to the Calendar of the Mayans, the conclusion of the year 2012 also stands for the end of a time cycle of more than 5000 years. It is still largely unknown that in alchemy also that year – as the seven preceding years of preparation – is of particular importance. Thanks to the researches of José Arguelles, the ancient knowledge about time which the Mayans possessed is now accessible again. By means of the ‘Harmonious Convergence’ on 16th/178th August 1987, he drew for the first time the attention to a larger public about the “final days” of the Mayan Calendar and the imminent qualitative leap forward in the history of humanity. The longest time period in the Mayan Calendar amounts to 26,000 years. Not only the current time cycle of 5,125 years ends up at the winter solstice on 21st/22nd December 2012, but also this big cycle. According to the ancient Mayan records, time has to be reborn on that day. Spiritual interpretations state that the prevailing human consciousness at that point will considerably influence the kind of development for the next 26,000 years. The Indian-vedic astrology speaks of a time span of 25,920 years, and also the records of other ancient cultures refer to a similar number. The real “pace setter” for that is the so-called “precession” of the Earth, that means, a circular rotation of the earth axis. It namely does not always stay in the same direction, but rotates around the ideal line of the axis – like a top-toy. It takes approx. 25,920 to 26,000 years for the earth axis to complete a circle. This time span is called a “platonic year” or in ancient astrology “a year in the life of God, the Creator”. One month of the platonic year lasts 2,160 earthy years. Due to the spinning rotation of the earth axis, it needs such a long time during which the vernal point (the position of the Sun at the spring equinox) moves through one of the 12 sun signs. If one divides this 12th part of the zodiac (360°:12 = 30°) again into sections of 1°, we get the duration of a ‘cosmic day’ corresponding to 72 normal earthy years. The average life span of a human being often lasts only a bit longer than one cosmic day. The equinox on its passage through the 12 sun signs moves in reversed order and, during these years (between 1960 and 2020), leaves the sun sign Pisces and enters into Aquarius. This marks the beginning of the ‘Age of Aquarius’ already being sung in the new-age musical ‘Hair’. Since the entering of the equinox into the new sun sign Aquarius after 2,160 years is already an extraordinary event, and even the end of the platonic year after almost 26,000 years, it so happens that the whole coincides with a much bigger time cycle: in 2012 our solar system crosses the equator of our galaxy and thereby quasi cuts the narrow “edge” of the whirly spiralic disc of our galaxy. Approx. 230 million years are required during which our solar system makes an orbit around the centre of the galaxy. So, there is the repetition of an event which happened last at the very end of the earth age of Perm. It was the time from which the first resinous woods originated, the dinosaur emerged and later the first mammals came up. Compared to this enormous time cycle of our solar system, the complete Age of Aquarius or Pisces hardly lasts one hour, and the human life span of about 72 years is in relation to that cycle of 230 million years only two minutes. It is a very important fact that in the next seven years to come we have the great opportunity of consciously experiencing and perhaps even shaping a little bit ‘the last 20 seconds’ of the 230 million years’ lasting countdown. According to the opinion of the English researcher John Major Jenkins, the Mayans have exactly “calibrated” their Holy Calendar on that meeting point between our solar system and the equator of the galaxy. Jenkins says, “The whole genesis of the Mayans can only be understood through the significance of that conjunction.” At the winter solstice 2012, the starry line of the Milky Way will encompass all around the horizon – it seemingly spreads circular on the Earth like a radiant archway through which the Earth now can enter with our solar system. The Mayan legends depict that the winter solstice is linked to the “First Father” One Hunahpu. According to this myth, one day he shall be reborn and initiate a New World Age. The bright starry gate of the galaxy with the dark cosmic opening can be understood as the birth channel of the Primordial Mother. Thus, at the same time, the winter solstice 2012 becomes the point of begetting or birth of the “First Father” and hence the beginning of a new time cycle of about 230 million years. “ The end of the cycle in 2012 means nothing less than the decisive qualitative leap in the evolution of light and life of the Earth”, writes José Arguelles in his book “The Mayan Factor”. Arguelles who rediscovered the Mayan Calendar explains in his book what is going to be expected during the last years of the big cycle / the “great synchronization beam”: “…the higher evolved DNA life forms of the Earth are exposed to a permanent acceleration.” He expects a “Crescendo of matter” whose purpose it is to enable a steady flowing in of “harmonical frequencies” and thereby a increasingly better “synchronization”. Such accelerated resonance shall transmit creative impulses to the human beings and help catapulting our solar system “into the community of the galactic intelligences”. In the meantime, many authors and private researchers suppose to have found real hints of such “acceleration” and “Crescendo of matter”. The NASA scientist Gregg Braden whose book “The Awakening of Zero Point” which I updated and supplemented, considers the following facts: The rotation of the Earth decelerates, the magnetic field of the Earth since the beginning of its measuring reduces more and more and has meanwhile decreased dramatically, the weather is in a state of performing violent caprioles, and also the seismic activities intensify. All this can be an indication of a pole leap which according to the rhythms observed in earth history is overdue since almost 10,000 years and could be expected to happen within the coming 1000 years. But what do we really know about the natural rhythms of the earth and the solar system? Our scientifically collected records are not older than 100 years, and all past events indirectly known from ice samples and rock stratums are ultimately based on theories and interpretations. While scientists and even more “apocalyptic prophets” for example have still believed some years ago that a pole leap would devastate the Earth within three days and that one could survive at best in deep caves and bunkers, the researchers of today are of a quite different opinion. Due to new computer simulations, they are convinced that the whole would gradually happen and almost imperceptibly in the course of many decades, whereas the actual tilting of the pole would only last 15 minutes. However, for some esoteric followers of the disaster theory, the apocalyptic pole leap at the winter solstice 2012 will be the inevitable event to “purify” the Earth before a real new birth of the planet and the humanity can take place. And “of course” the followers of this theory will be saved! Like that, the year 2012 will unfortunately be misused in order to make people anxious and dependent. 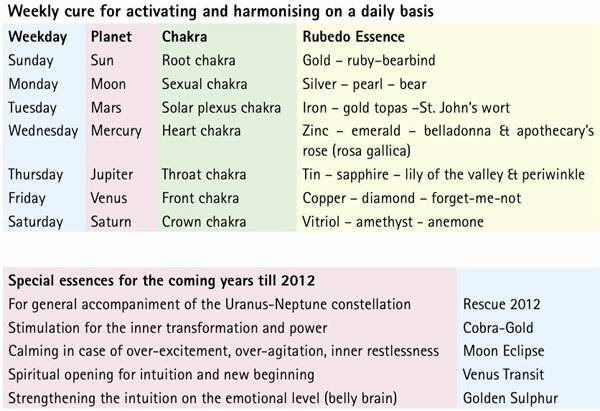 Alchemy throws quite a different view on the conclusion of the year 2012 that emphasizes the cyclic rhythms of the planets and their courses as well as the incidents happening on earth, and not a catastrophic aggravation. 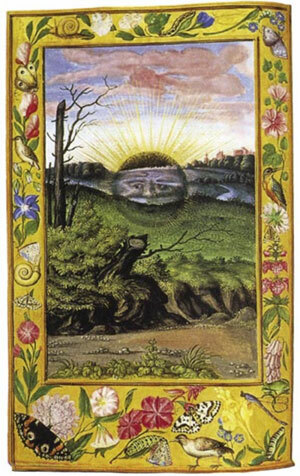 Therefore the motto of alchemy is: “As in heaven so on Earth” or “As above so below”. The secret doctrines of alchemy about the “energetic phases of change” in man deciphered a few years ago are closely connected to the cosmic rhythms of the planets, their influences upon Earth and, consequently, upon ourselves. There are short rhythms lasting only one week and the various long cycles of the planets which can last from one year to many centuries. This planetary knowledge is necessary in alchemy in order to produce healing essences of high quality from metals, gems and plants in the laboratory. For example, since ancient most times, Moon relates to silver, Sun to gold and Venus to copper. Even today the constellation of the related planet is taken into consideration and “captured”, when such metal, gem or plant essences are produced in the small alchemy factory of the well-known German alchemist Achim Stockhardt. If one takes these essences, a negative influence of the related planet can be harmonized. In the course of the last thousand years, a part of the knowledge about these planetary forces has separated from alchemy and led into the astrology of the present day. However, much what alchemy and astrology read off the planetary rhythms tally with statements made by Arguelles about the Mayan Calendar. Like in the Mayan Calendar, here also many “wheels of time and planets” may interlock and create again and again new qualities which are able to influence the human beings. Therefore, of great importance for the next seven years until the end of 2012 is the passage of Uranus through the sun sign Pisces and of Neptune through Aquarius. Only in 2011 and beginning of 2012 they again leave these sun signs without losing their immediate impact. Both sun signs stand for consciousness: Aquarius for the human spirit and Pisces for higher states of consciousness. For the human being, the entry of Uranus into Pisces means that his limitations will be eliminated: the individual awareness merges into the collective and unlimited consciousness which can lead to dissolving past concepts, systems and social relations. The individual can lose his stability in his environment. This will be enforced by Neptune in Aquarius, because here the individual consciousness will be overrun by the unlimited. To the individual, everything will be accessible, but also one will easily get fed up with it, whereas one will hardly be in the position to suppress it. The ability to coordinate is under a too great strain, the nerves get over-excited, explosive outbursts increasingly occur as well as feelings of powerlessness. There will be more and more cases happening with a rising tendency. The whole, however, contains enormous possibilities: The positive aspect of this constellation opens doors for the human being to enter into the collective sub-consciousness or cosmic consciousness. The individual consciousness can be linked to the whole. In fact, all this is indicative that we will go through a deep phase of inner cleaning and new orientation until 2012. During the year 2012 until the winter solstice, Uranus passes into Aries and Neptune into Pisces. These qualities also enhance the “new beginning”. An appearing disillusionment and the yearning for expansion and freedom invite to recapitulate. The positive impulse will be to create this freedom in our inner being: a new boundlessness to be realized inside in form of love, compassion and creativity. We get winged to start afresh by trusting our own experiences and our own intuition. When Arguelles through his interpretations of the Mayan Calendar speaks of “acceleration”, “Crescendo of matter” or “a never before existing fusion of consciousness”, it corresponds to the described constellation of Uranus and Neptune. So it seems that the planets of our solar system pull us towards a new orientation. The last time, when Uranus and Neptune transited these signs together, it was about 165 years ago, between 1836 and 1848, the year of the French Revolution. If one gets back even further, the time period in which Uranus and Neptune stayed together in these signs becomes shorter or there is no more overlapping at all, meaning, beyond the cycle of 165 years there is a time rhythm of thousands of years. Alchemy, however, has always to do with the practical side of astronomy. It therefore is in search of means and methods to support the human being in the approaching processes. Like that, a special essence has been developed supporting a better use of the positive aspects of the Uranus-Neptune constellation. It is the essence – Rescue 2012 – that opens the consciousness to the cosmos, but at the same time cares that one does not lose the ground. Several people still need some impetus in the years to come to perform the inner transformations. Here a special gold essence helps, the “cobra-gold”, developed according to an old Indian recipe. For those who react upon the Uranus-Neptune constellation with over-stimulation and “flapping nerves”, the special silver essence “Moon Eclipse” has been prepared during the moon eclipse 2004. It has a great calming effect. Three special heavenly events can be expected until 2012, and all three will be able to support the positive sides of the Uranus-Neptune constellation: On 27-05- 2009, there will be an encounter between Jupiter and Neptune. This conjunction strengthens the creative recognition up to the depths of the collective sub-consciousness and the higher planes of consciousness. The higher spiritual powers, like intuition, telepathy, knowledge through dreams, channelling, etc. will be intensified. As Chiron also participates in the conjunction which happens in Aquarius, healing and creative impulses will become effective. Eight months later, this quality will again get activated, when the planet Jupiter enters the sun sign Pisces. In the middle of this year, Jupiter meets Uranus on 19-09-2010. This second great conjunction activates our inspiration. Creative ideas get the necessary fire, the individuality expands and unfolds in a new positive manner. As the conjunction takes place in Pisces, surprising solutions and creative breakthroughs come up also covering the collective consciousness and the sub-consciousness. At the same time, there will also be a conjunction between Neptune and Chiron, again resulting in a flow of healing energies. The third extraordinary event at the planetary sky will happen on 06-06-2012, namely the second transit of Venus after 2004. The last overlapping of Venus and Sun took place in 1874 and 1882. This heavenly meeting will especially strengthen the love life and the community life and reduce the dissolving force of the Uranus-Neptune constellation. In the Holy Mayan Calendar, Venus plays a significant role, and it is astonishing that this rare event will happen just six months before the winter solstice in 2012. These special constellations, too, will be used by the practical alchemy to support the positive powers in the global process of the change of consciousness. Already during the first Venus transit on 04-05-2004, foresightedly, a special essence from copper and gold, diamond and ruby, namely from the metals and gems of both planets were prepared. With their help, the person taking the essence can better open himself/herself to the spiritual forces of the Uranus-Neptune constellation. The same time and planetary quality of the Venus transit in 2004 was also used to prepare an essence for strengthening the “belly brain”, i. e. the emotional intuition and mediality: the “golden sulphur” essence. This sulfur extracted from a natural combination of antimony and sulfur still contains the purifying and transforming power of the antimony ore. It is this antimony which Rudolf Steiner called “the metal of man”, because it is like the human being half mineral and half metal floating between heaven and earth. Thus, the essences “golden sulphur” and the “Venus transit” complement each other by stimulating harmoniously the whole spiritual powers of “head, heart and belly”. In order to permanently raise the state of vibration of individuals, the Indian alchemists have developed an energetic “weekly cure”: the so called “medicine of the maharajas”. The name derived from the time when priests were kings, where the candidates for the maharaja title had to apply this “weekly cure” three times seven years in connection with their spiritual studies and exercises for the personality and consciousness unfoldment. Only that candidate who could heal by laying on his hands and thus give evidence of his spiritual qualities was worthy to rule as “king of the kings”. Applying this “weekly cure”, the human organism, its energy system, chakras and glands get tuned to a harmonious resonance with the planets. Every day of the week is governed by one planetary energy. This knowledge is contained in the names of the weekdays: Sunday refers to the Sun and Monday to the Moon. Tuesday derives from Zius, the Germanic God of War, which corresponds to Mars (refer to my book for details: “Schätze der Alchemie: Metall Essenzen” and “Edelstein-Essenzen” – “Treasures of Alchemy: Metal Essences” and “Gem Essences”). During the “weekly cure”, one essence is taken that belongs to the planet of the day: Sunday the essences of gold, ruby or bearbind; Monday the essences of silver, pearl and pear, etc. At the same time, the chakras get activated and harmonized, from the root chakra on Sunday ascending to the heart chakra on Wednesday up to the crown chakra on Saturday. This secret planetary attribution of the chakras from the alchemy of India and the West as well as from Ayurveda is in tune with the highest state of vibration of the human being. In alchemy it is called “Rubedo”. Through the “weekly cure”, man is expected to be led step by step from the material plane of “Nigredo”, the lowest state of vibration, into “the light”. For unless we open ourselves to the daily rhythm of the planetary forces and harmoniously integrate them, we will not be able to positively use the great constellations for our personality and consciousness which the cosmos offers us in the next seven years - starting with the Uranus-Neptune constellation and the two Uranus conjunctions up to the unique encounter of our solar system with the equator of the galaxy. According to the tradition, this weekly cure is carried out in the Indian alchemy with the gem essences. But also the metal or flower essences or – even more effective – all three together can be applied. Thereby the gems correspond to the plane of the spirit, the metals to the body and the flowers to the soul.